This entry was posted in Canada Immigration and tagged Apply for Canada PR canad Canada Citizenship Canada Express Entry Canada PR Canada PR Visa on May 24, 2017 by Blog Author. 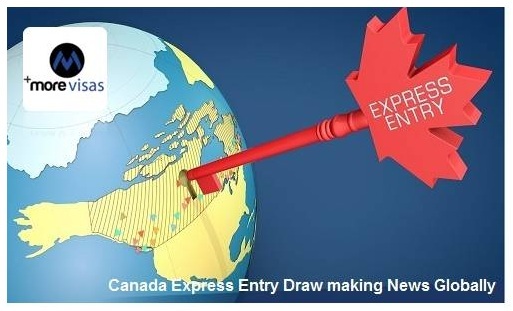 The Canada Express Entry draw witnessed significant changes in the CRS-Comprehensive ranking score by taking just 415 points to qualify yourself a Canada immigration which happened on May 17.The process for generation of Visa for Canada PR has now become effortless with candidates experiencing Visa permit issued in just six months span. The Canada Express Entry draw which started initially had accepted a score of even 886-CRS points which has now dropped to 415 CRS points. Till the last express entry draw 43,456 Visa applications have been accepted which converts the chances of a Visa applicant to be taken with a set score if he/she meets the criteria. Canada PR is most cost-effective Visa immigration program designed under Canada Express Entry which helps you manage yourself a permanent resident tag in any Canadian Province. Canada exhibits overwhelming welcome of its applicants who are traveling for any purpose whether be it studies, Job suiting candidate’s previous profile, visa for dependents on the applicant, etc. The basic minimum requirements to be fulfilled are that of language skills, age, educational background and work experience if any. There are multiple Visa programs under Express Entry which are PNP-Provincial Nominee Program depending on Canadian Province-Ontario, Quebec, Montreal, Toronto, Alberta where people travel generally. The changes in score requirements change dynamically based on the demand of the current market condition. Hence it is important to follow each and every rule issued for Canada Immigration.